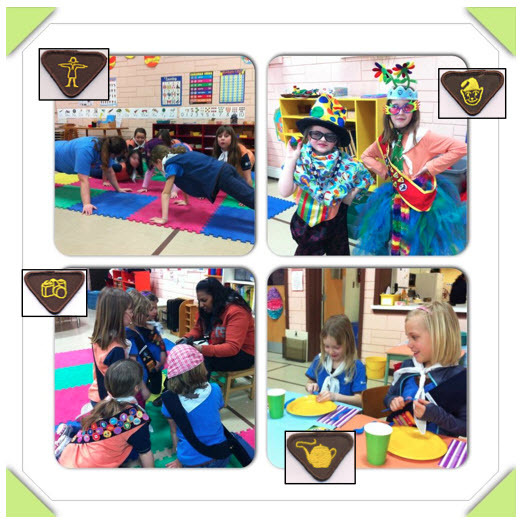 The 111th London Brownies arrived to our weekly meeting and were asked to sign up for one of four badges. All they were told was the name of the badge, and that we only had a certain number of each badge. At the station for the Photography Badge, they were introduced to a 12-year old film camera. “Click” (our photography obsessed leader) asked them how old they thought it was – 100 years old? 78 years old? She told them about the mysterious film cylinder, and together they loaded the film in the camera. As per the badge work criteria, they each took four photos of different subject matter, and Click had the film processed over the next week. Over at the Hostess Badge station, the girls learned about a story that helped them remember how to organize the cutlery on a properly set table. They made a GIANT mock invitation, and had to think of all the important information that needs to be included. They also made a thank-you card to appreciate some of their favourite people…their Brownie leaders! At the Jester Badge, two girls had the opportunity to go nuts and dress up in crazy clothes. We then “recited children’s poetry” to each other (because that’s what the Brownie Manual told us to do!). We quickly made up silly actions to our Brownie Opening Song. Then they got to choose a fun song and make up a silly dance to the music. And ta-da! Two new jesters were born. For the Athlete Badge, the girls were put through a rigorous physical test. It included throwing a tennis ball into a small bucket from a distance of 4 metres, jumping straight up to a height of half your own height, push-ups catching a bean bag from a distance of 5 metres, and skipping forward for 30 seconds. We had a good laugh about how specific the criteria were for this badge, as it even had different criteria for girls aged 7 and 8! Guider Cosmo, who ran this badge, noted that if she was being a really strict leader, many girls wouldn’t have earned the badge! They put a great effort into it though, and they were sweaty and smiling! Written by Bri Arnold. Bri is a leader in the 111th London Brownies, as well as the 1st Ontario Lone Sparks and Brownies. She is at Fanshawe College for Early Childhood Education, and runs a day camp for youth with disabilities in the summer. Read her previous posts on GirlGuidesCANBlog: Lending a Hand to Camp and Lone Guiding Rocks. This entry was posted in Awesome Activities and tagged brownies, civics, history, meeting ideas. Bookmark the permalink. Great idea, love it and sounds like the girls did too. Having your Brownies complete old Brownie badges sounds great ! It seems like this would be a wonderful opportunity for the girls to learn a bit about the history of Guiding and how Brownies has changed over the years, while also participating in activities on a topic that interests them. Thanks for the idea! I think we`ll try to get some old badges and try this with our Unit. That’s great! What a great way to use those old badges! I had some of those badges! Fun idea for a meeting!